Location/ Directions: I-25 N-bound: exit 213 to Park Ave., turn left. I-25 S-bound: exit 213 to 38th Ave., left at Fox, left at Park. Drive under freeway, left at Globeville. About Hotel: 3-Stories, 106-Rooms, Interior Corridors, Free Bright Side Breakfast, Free High-Speed Internet Access, Free Local Calls, Free Parking, Guest Laundry Facilities, Outdoor Swimming Pool, Pets Welcome, Free wireless Internet access in all rooms, Premium Cable Channels, Coffee Maker, Hair Dryer, Iron with Ironing Board, Voicemail, Alarm Clock. Railroad View: Excellent view from rooms on 3rd floors on the east side of the building, 2nd Floor, east side ok as well, though some tree tops could get in the way.. South end of the building is preferred. 1st floor rooms have the motels wooden fence and BNSF's chain link fence obstructing view. BNSF yard, yard office, and train crew parking lot is next to the motel. Plenty of lighting at night to watch the action! Railroads past Hotel: BNSF Railway / Amtrak (# 5 + 6) / Union Pacific (local only). Action is non-stop, always something moving around the yard. Trains move at 5mph in/out of the yard. Notes: If you want to see trains in Denver, this is the place to be! Rooms with the best view; 319,321,323,325,327,329,331,333,335,337,339,341. 2nd floor = 200's with same last 2 digits have a view, but some tree tops may block part of the view. Oh, and if for some silly reason you can't get a room with a railroad yard view, the front of the motel looks out over a single track line. For those that want a view of both rail lines (yard lead & single track line), try rooms #'s; 309,311,315,317,209,211,215,217,109,111,115,117. 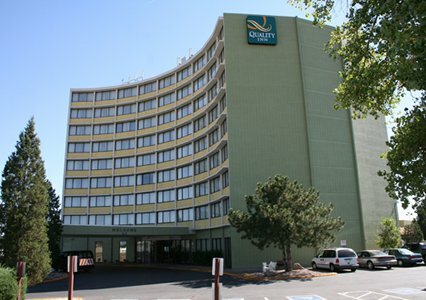 Comments: This building as actually an older exterior corridor motel that La Quinta remodeled & completely updated. They did an excellent job turning what I'm sure was a "cheap motel" into a La Quinta Inn. 2 Thumbs up! 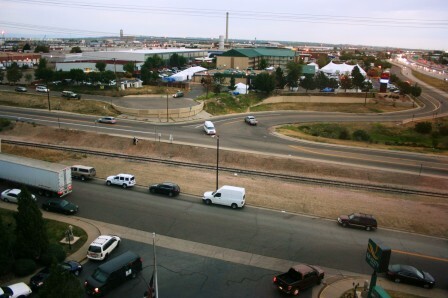 Beside a view of the south end of the BNSF yard & yard office, the Denver skyline & Mile High Stadium can also be seen from the motel. The motel also has a security guard overnight, not sure what the story is behind that. Also, even though trains pass at 5mph, they do make noise; switching & slack running in and out of cuts of cars is easily heard and can keep light sleepers awake. The outdoor corridor is a nice place to take pictures & videos. Just don't forget to say hi to the security guard that walks past every 20-minutes! Photo Comments: (Left); Standing in front of room # 321,a southbound BNSF train departs the yard. (Middle & Right photos); Night & Day trains arrive and depart the yard. Most coal trains (and empty hoppers) operate with DPU locomotives at the end of the train. 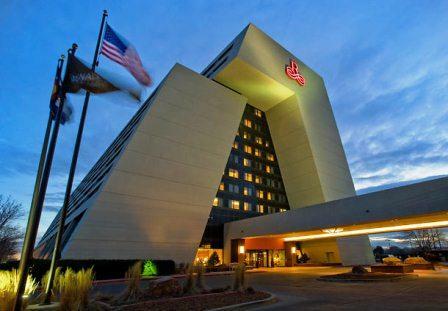 Location/ Directions: I-70, take Exit Pecos to 48th Ave.
About Hotel: 9-Floors, 213-Rooms, Interior Corridors, Free hot breakfast, Free wireless high-speed Internet access, Free local calls and free parking, Free shuttle within a five-mile radius to local points of interest, Pets Allowed (fee), Business Center, Elevator, Free Coffee, Free Newspaper Mon-Fri, Guest Laundry, Pool Table, Rental Refrigerator, Restaurant, Seasonal Outdoor Pool, Truck & Bus Parking, Cable/Satellite TV, Hair Dryer, In-Room Coffee Maker, Individual A/C & Heat, Iron & Ironing Board, Room Service, Wake-Up Service. Railroad View: Excellent View of a very quiet industrial track. Any room on the north side of the motel (front, above lobby) will give you an excellent view. High floor rooms that end with digits x26, x27, x28 will offer a distant view of the busy Union Pacific North Yard located within walking distance of this hotel. Railroads past Hotel: Union Pacific Railroad. This is an industrial track that connects Union Pacific's North Yard with the BNSF Yard. During my 16-hour stay, not one train passed the hotel on this trackage. I didn't expect this to be a busy track, but it would have been nice to see atleast one train pass. The track is shiny, I just hit it during the wrong time of the day. I was at the hotel from 6:30pm to 10:25am the next morning. Notes: This is a former Best Western Motel. 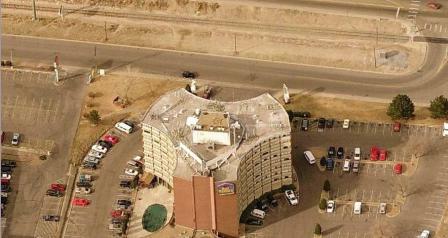 This hotel is within walking distance of UP's Denver North Yard (although I'd advise taking an automobile). The yard is off limits to the public, but pictures can be achieved from public property. 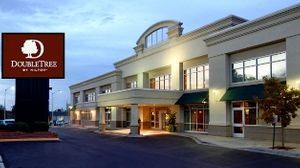 Since the track which is viewed from this hotel is very quiet (train wise), we recommend staying at the La Quinta Inn located a few minutes south of here (also listed on this web site). The LQ is located at the busy BNSF yard with a great view of passing trains. Then again, the breakfast at this Quality Inn can't be beat! Photo Comments: Floor Plan Diagram: The floor plan of the hotel shows the second two digits of the room number, the first digit (not shown)will be thew floor number. Rooms that end with 20,21,22,23,24,25,26,27,28 will offer a railroad view. 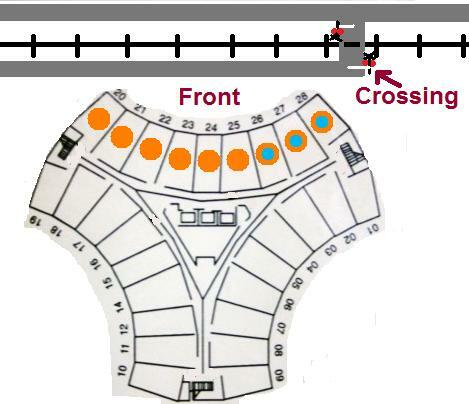 The high floor rooms with the blue dots (i.e., 26,27,28) will offer a distant view of Union Pacific's North Yard in Denver. Aerial Photo, Below Left: This aerial view is looking northward. You can see the single track railroad across the top of the picture. Below Right: A photo taken from room # 827 shows the view of the industrial trackage from the room. If a train had passed during my visit, I would have had a great view! This is a busy area for automobile and truck traffic. Parking at the hotel was at a minimum due to an event taking place at the hotel. About Hotel: 299-Rooms, Interior Corridors, Free Parking, Pets Allowed, Heated Swimming Pool, Air Conditioning, Car Rental Desk, Coffee shop, On-site parking, Alarm clock, Cable television, Complimentary in-room coffee or tea, Concierge desk, Fitness center on-site, Full breakfast, Hairdryer, High speed internet access (fee), Iron/Ironing board, Laundry/Valet service, On-site business center, Outdoor pool, Voice mail. Railroad View: Good to Excellent railroad view. View of the tracks is clear from southwest (west) side of the building. High floor rooms will be best. My room was on the southeast (south) side of the building (Room # 443), my view was good and I was able to photograph passing trains with minimal obstructions. Railroads past Hotel: Union Pacific / RTD Trainsit Rail - A-Line (FasTracks Regional Transportation District of Denver). Transit trains pass every 10-20 minutes (24 hours), during my 15 hour stay only one freight train passed; at 3:46am. Can’t say I didn’t miss any while sleeping. Union Pacific does maintain a double track railroad past the hotel (freight only trackage, RTA has their own line, also double track). I would think there would be more than one freight passing during a 15-hour stretch. Notes: Hotel windows do not open. During my 2016 visit all trains blew their horns for the crossing. Each hotel room had a letter left for the guests explaining “You may hear an occasional whistle while federal mandated testing is still in progress”. During my visit “occasional” was every 10-20 minutes. The horns on the transit trains were much louder than the freight train horns. I expect from this writing, the crossing may have become a “quiet crossing”, which the hotel was implying would happen. Photo Comment: Standing just south of of the railroad crossing on the corner of Quebec Street & Smith Road looking north, the Doubletree Hotel is the large building picture. The set of tracks closest to the photographer is the RTD Transit rail line which is a new set of tracks that run between the airport and downtown Denver. The next set of tracks 40 feet to the north is a Union Pacific double track line. Location/ Directions: I-70 to Exit 278 (Quebec Street) Left on Quebec to hotel on right. About Hotel: 12-Floors, 399-Rooms, Interior Corridors, Free Wireless access, Pets Allowed, Restaurant on site, Indoor & Outdoor Swimming Pool, Room Service, Vending Machines, Air Conditioning, Continental Buffet Breakfast, 24-Hour Front Desk, Coffee shop, On-site parking, alarm clock, Air conditioning individually controlled in room, AM/FM radio, Cable television, Coin operated laundry, Complimentary in-room coffee/tea, Complimentary newspaper delivered to room, Concierge floor, Connecting rooms, Direct dial telephone, Elevators, Fitness center on-site, Full business center, Full service housekeeping, Gift/News stand, Hairdryer, Ice machine, Iron/Ironing board, Room service, Voice mail, Wakeup service. Railroad View: Expect an Excellent View. While most high rooms floors will offer a railroad view, 4th floor or higher on the east side (Quebec Street side) should provide the best railroad view. Railroads past Hotel: Union Pacific / RTD Light Rail - A-Line (FasTracks Regional Transportation District of Denver). 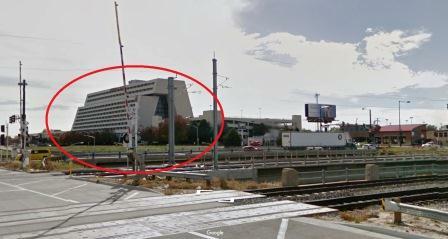 Photo Comment: Looking southwest from the Quebec Street railroad crossing, the Renaissance Hotel is circled in red. The two tracks in the foreground belong to Union Pacific, the following set of tracks are part of the RTD light rail system.